Being outside. Throwing your arms up in the air. Simply because you can. Sunbathing. A book to that? Dancing in the warm rain. And finally being barefooted again. Counting the stars, whilst thriving in the coolness of the night. Celebrating simplicity. Complicated can come back later. Even more sun! And noshing tarte flambee. Knead the ingredients for the dough until it is smooth and soft. Cover the bowl and let it rest for 1-2 hours if you’ve got the time (the resting isn’t really necessary but it will be better with it in the end). Cut the pear into small dices. 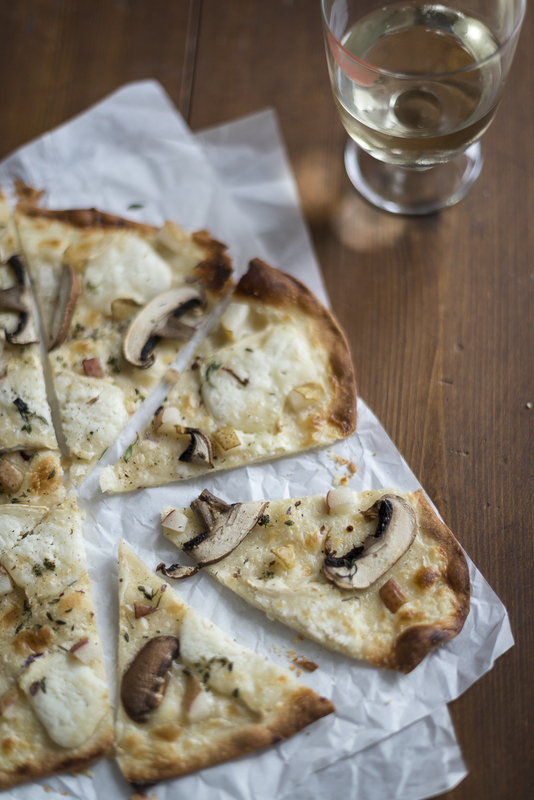 Cut the mushrooms and the cheese into slices. Divide the dough into two halves and roll out each of them very thinly, until you almost can see through. Put each of them onto a baking tray with baking paper. Spread half of the sour cream thinly onto each tarte and scatter half the remaining ingredients onto each tarte as well. Bake for 5-10 minutes until the dough is crispy. Serve hot.